Though I often have the opportunity to enjoy great meals, it is not often that I have the chance to sample the cooking of a talented young man like Steven De Salvo. Steven is the grandson of our friends Ernie and Louise De Salvo. This dinner was at the home of their son Jason and his wife Deborah. Steven has always been interested in food and is studying it in college. He works part time at one of New Jersey’s best restaurants. 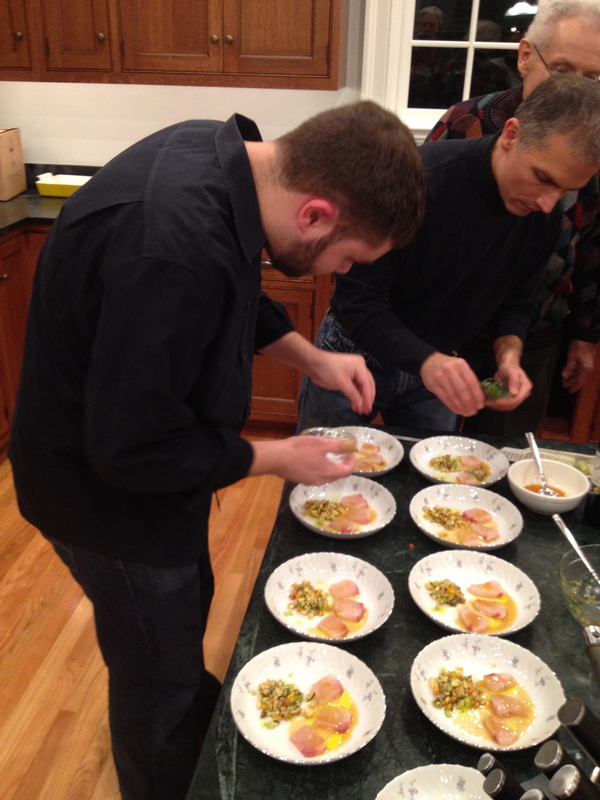 Steven planned and prepared the meal, paired with wines supplied by his father, Jason, and the dinner guests. The report that follows includes Jason’s wine notes because he has an excellent palate and wine memory. 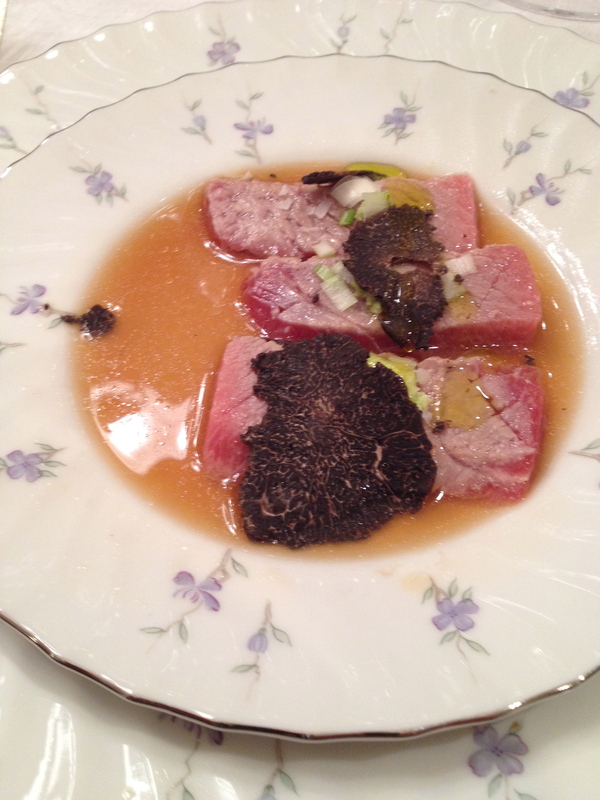 Our meal began with three different crudos, among them lightly torched bluefin toro with dashi broth and scallions. This was a perfect starter before a meal with so many rich flavors. Next there was wild mushroom lasagna with spinach, ricotta, and truffle Gouda finished with a healthy shaving of black truffles. 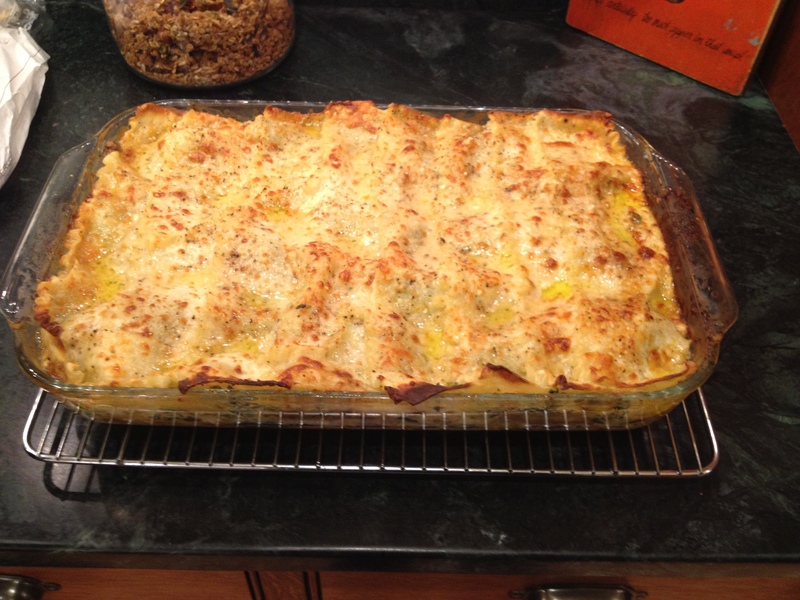 I have never had Gouda in lasagna before, but it balanced the other flavors and added savory cheesiness without overwhelming. It was great to see Steven’s creative touch working so well. 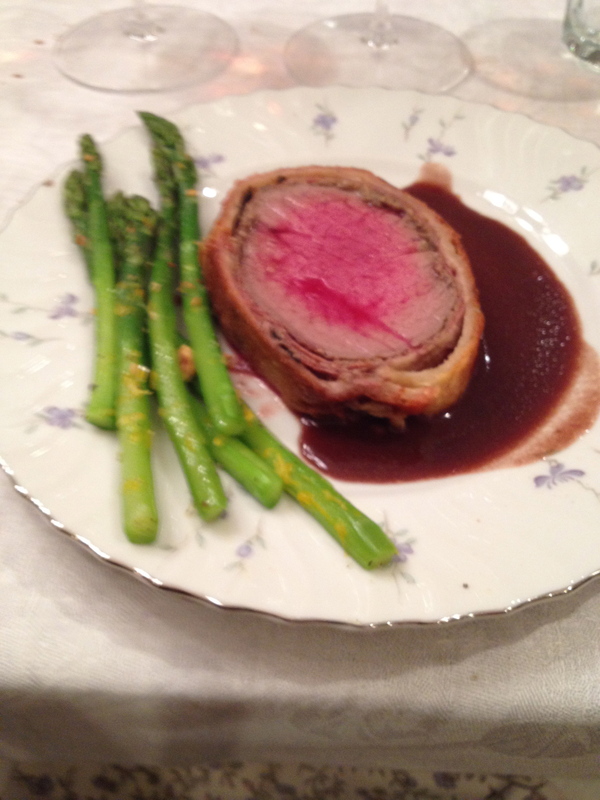 For our main course, we had beef Wellington with black truffles and prosciutto. 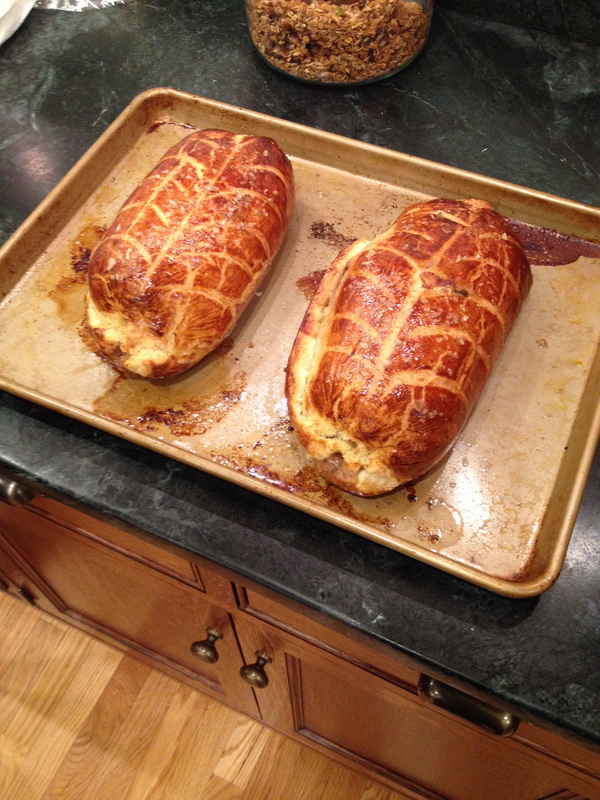 I can’t remember the last time I had beef Wellington, and this was a treat. The pastry was beautiful and the beef was cooked perfectly. 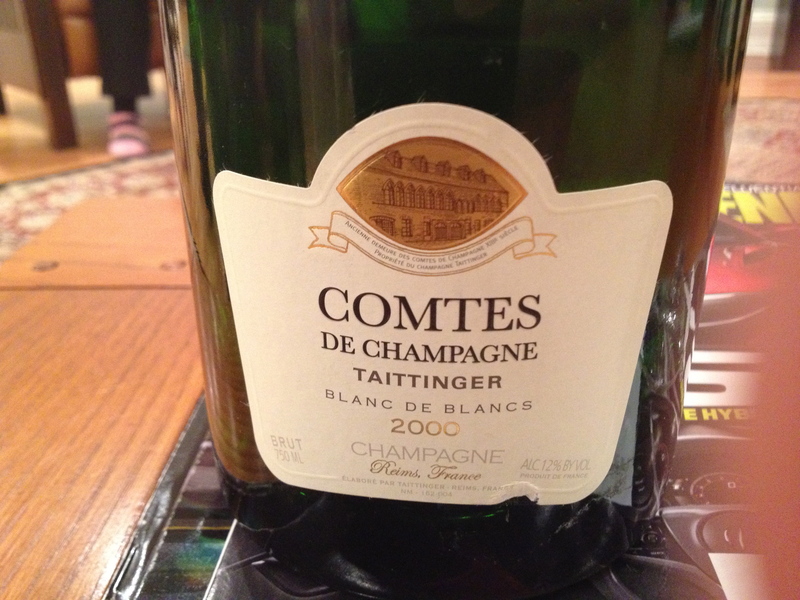 Taittinger Comtes des Champagne Blanc de Blancs 2000 The grapes come from the Grand Cru vineyards of Cramant, Les Mesnil, Oger, Avize and Oire in the Cotes des Blancs. The unblended wines are aged in stainless steel to retain their pure character. This is followed by 7 years of bottle aging in the cellars before release. This is a rather full-bodied Champagne for a Blanc de Blancs. It is elegant with hints of citrus fruit and a touch of raisins and bread. It is drinking very nicely and went well with the food. 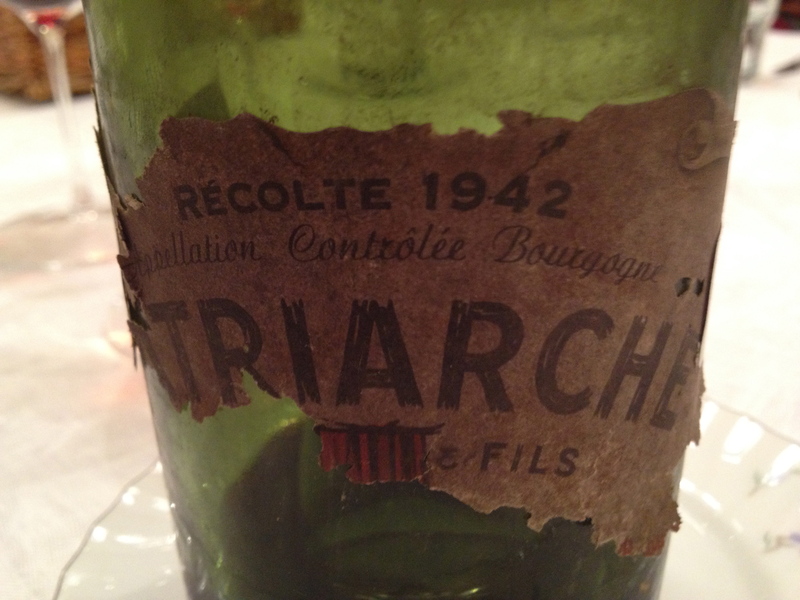 1942 Patriarche Pére & Fils – wine merchants and producers have been in business for 230 years. They are in Beaune and have the largest cellars in Burgundy (5km). This was the oldest wine and it was still drinking very well. I purchased this wine in Paris. 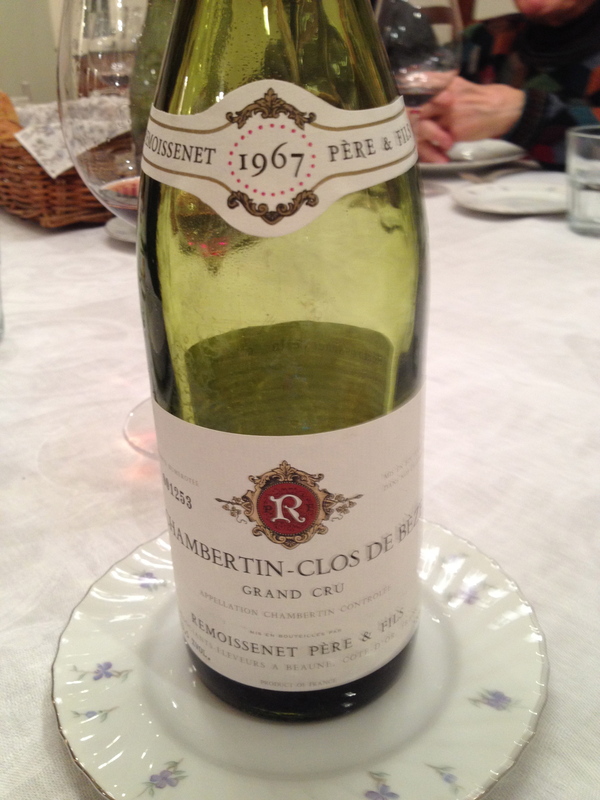 1967 Remoissenet Chambertin Clos de Beze Recent Release from Domaine. Light-medium ruby color. Jason: The nose is gorgeous with red currants, black cherries, minerals, damp earth and a touch of sauvage. On the palate this is both elegant and powerful with a velvety texture, excellence balance and long finish. 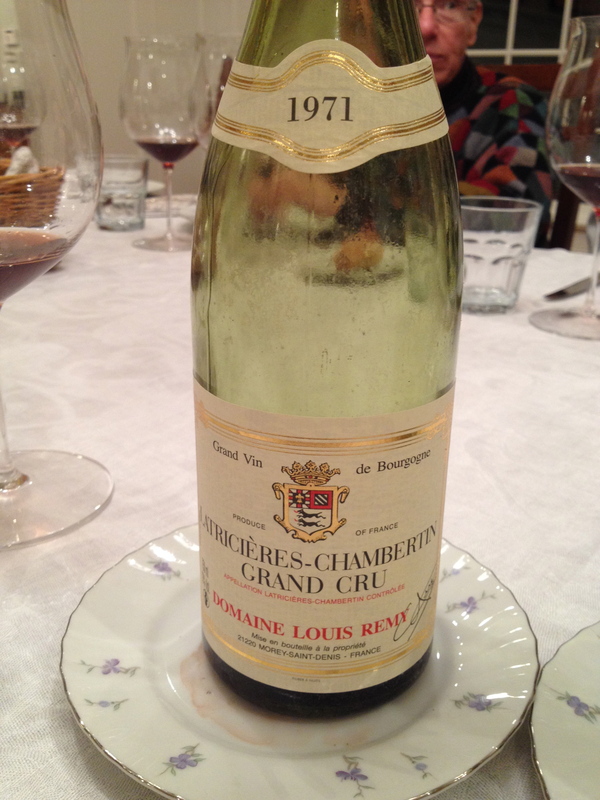 1971 Domaine Louis Remy Latricieres-Chambertin. This was from a recent release. Jason: Light-medium ruby-garnet color. Flowers, red cherries, Gevrey Earth and baking spices on the nose. Bears a striking resemblance to the Philippe Remy 1971 Chambertin that we had alongside it. On the palate this is sweet with a note of iron filings to the taste. Velvety and medium long finish. 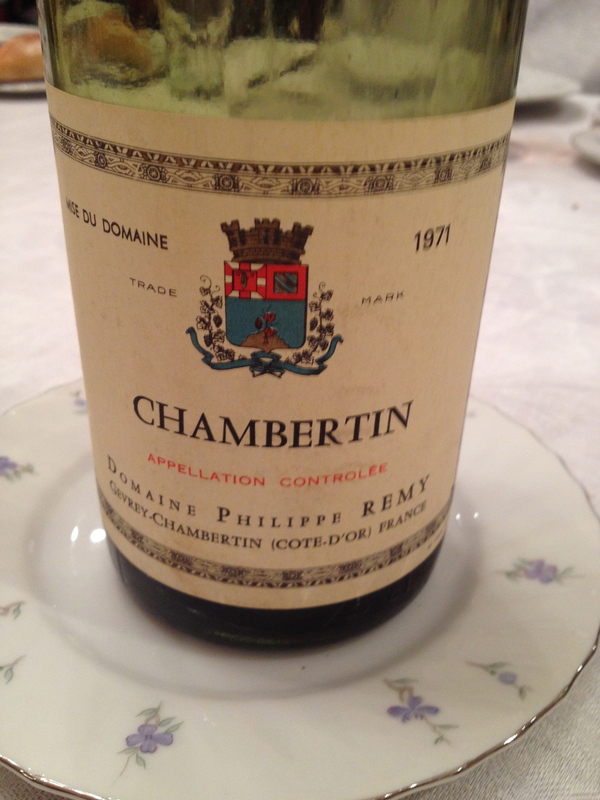 1971 Domaine Philippe Remy Chambertin. Jason: The nose here is strawberries, earth, baking spices, flowers. We had this alongside a 1971 Louis Remy Latricieres-Chambertin. On the palate this is deep, gorgeous, nuanced, velvety and long. A great bottle of wine. Both Jason and I agree that these last two wines will age for a number of years. Granbussia Riserva 1974 and Riserva 1989 Aldo Conterno made from Michet and Lampia varieties of Nebbiolo. Harvest is manual with grape selection in the vineyard and the harvest takes place in mid-October. Vinification is in wood with maceration of the skins in large Slavonia oak casks. The must remains in contact with the skin for 60 days, during which alcohol fermentation is fully completed. The wine is then placed in large Slavonia casks for 32 months. The grapes for the Granbussia Riserva are from the oldest vineyards: Romirasco 70%, Cicala 15% and Colonello 15% depending on the vintage. The wine remains in the cellar for 8 years before release and is only produced in the best vintages. 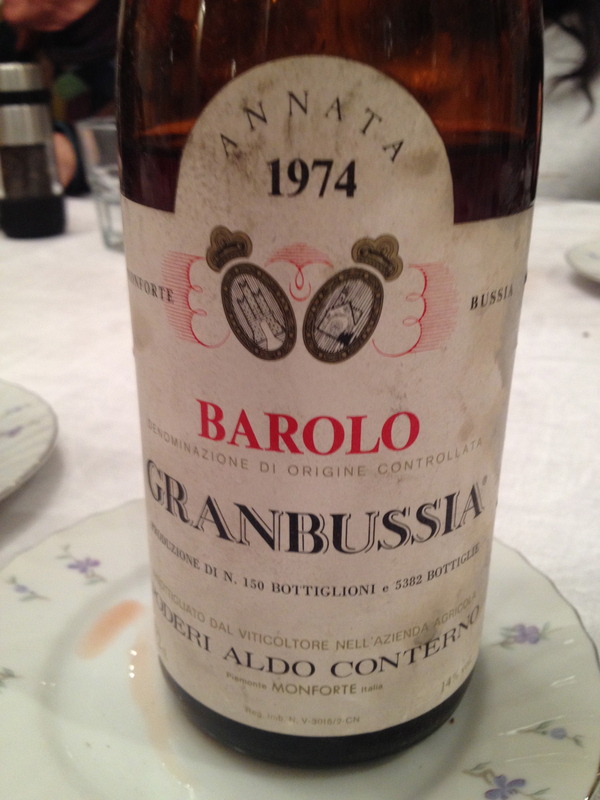 1974 was not a great year for Barolo and it was given a lot of attention because 1972, 73, 75, 76 and 77 were off vintages. The wine was showing its age and it was well passed its peak. 1974 Jason: Some of the guests really liked this. Everyone else hated it. They thought that it was flawed and over the hill. For me the best two vintages since 1982 have been the 1989 and the 1996. 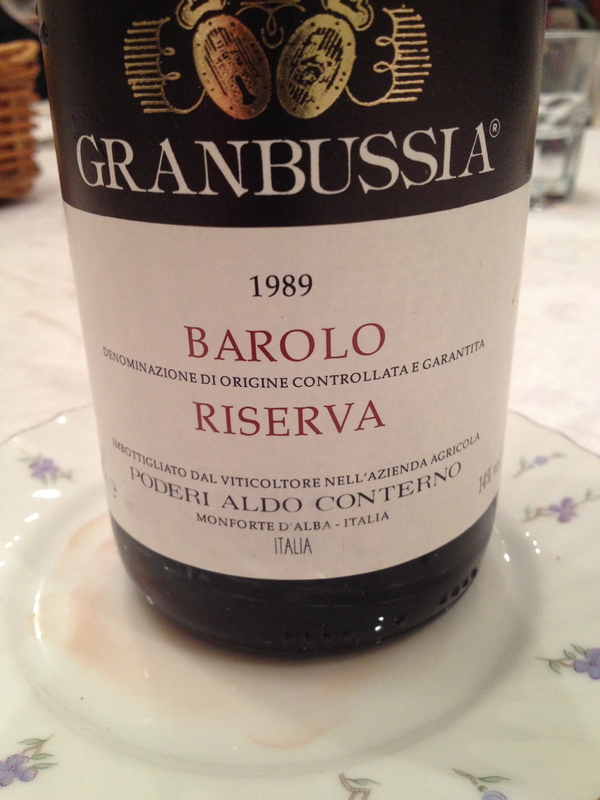 The 1989 is a wine with all the classic Nebbiolo aromas and flavors: cherries, prunes, tar and leather. It is a wine that will last. Jason: Double Decanted for 4.5 hours. Medium-deep ruby color. The nose is white pepper, red cherries, licorice, black truffles, with a distinct “vinyl” omponent. On the palate this is more closed in on itself than I remember it being. Maybe this has entered a bit of a dumb stage or maybe it’s a less than perfect bottle? Finished the last 40% of the bottle two nights later after it was stored in the refrigerator in a 1/2 bottle and it was even better than two days prior. The flavors have knitted together and become deeper and more profound. 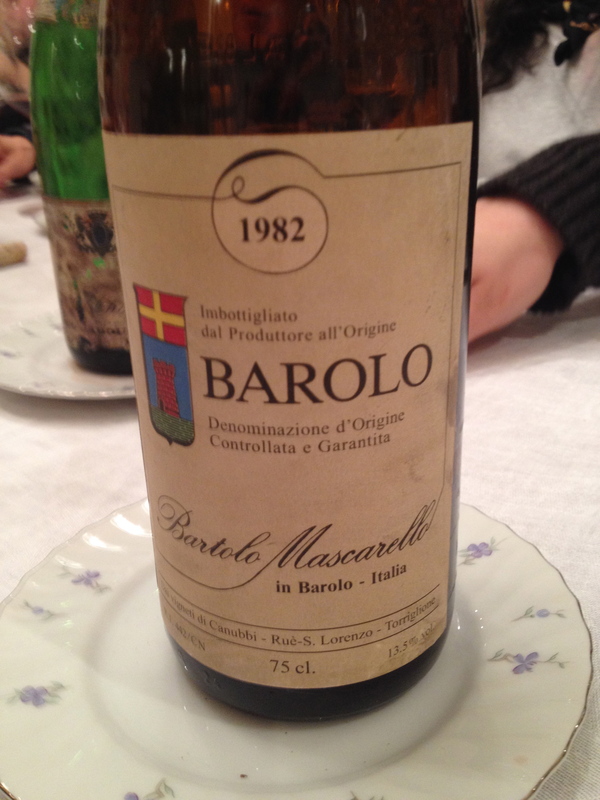 Cantina Bartolo Mascarello 1982. About 13 years ago Michele and I visited the winery with Alfredo Currardo, a close friend and owner/wine maker of the Vietti winery. Bartolo and Alfredo spoke about wine and Bartolo was teasing Alfredo and told him that he made “industrial wine” because Vietti produces, as Bartolo said, “so many wines”. I only wished I had a movie camera with me at the time to record the conversation between these two legendary wine makers. Both Bartolo and Alfredo are no longer with us but Maria Teresa, Bartolo’s daughter, continues to make wine in the same uncompromising style as her father–traditional, classic Barolo at its best. This is a great wine in a great year and it will age. Jason: Double decanted for 4 hours. Stunning wine. Too tired to take detailed notes at this point, but this was drinking really well right now. 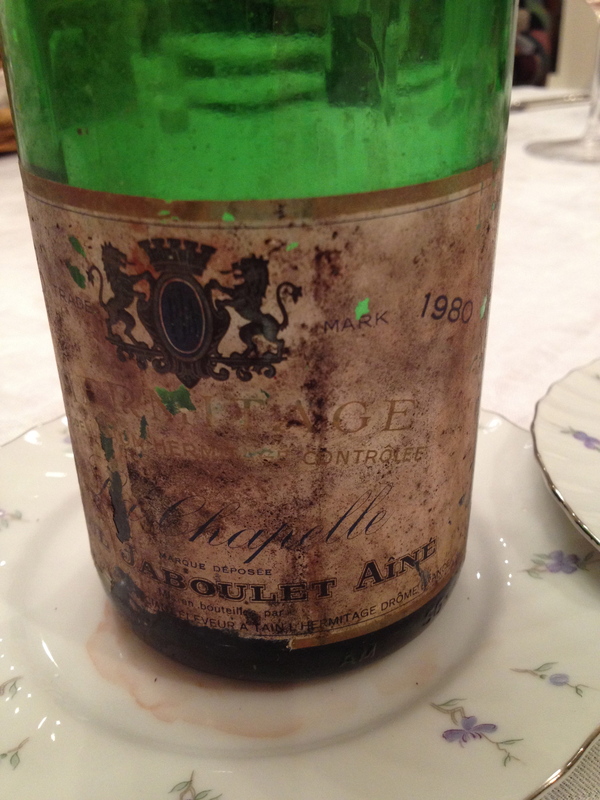 Hermitage La Chapelle 1980 Jaboulet 100% Syrah is planted in a diversity of terroirs. The age of the vines is 40 to 60 years. The grapes come down from the slopes of l’Hermitage on small sledges and then are sorted manually and vinified traditionally in the cellars. The final assembly is made during aging in our cellars in wood for 15 to 18 months. During this time the wines are also racked. This is a complex and elegant wine with hints of black fruit, spice and leather. It has a long finish and very pleasing aftertaste. It is at its peak and was the wine of the evening. I also purchased this wine in Paris. Jason: The nose here is gorgeous. Soaring aromatics with smoked game, beef jerky, camphor, black cherries and bacon fat. On the palate this is also stunning. Deep, balanced and hugely nuanced. I have never before had a Hermitage from 1980, and I must say that this was impressive! WOW. 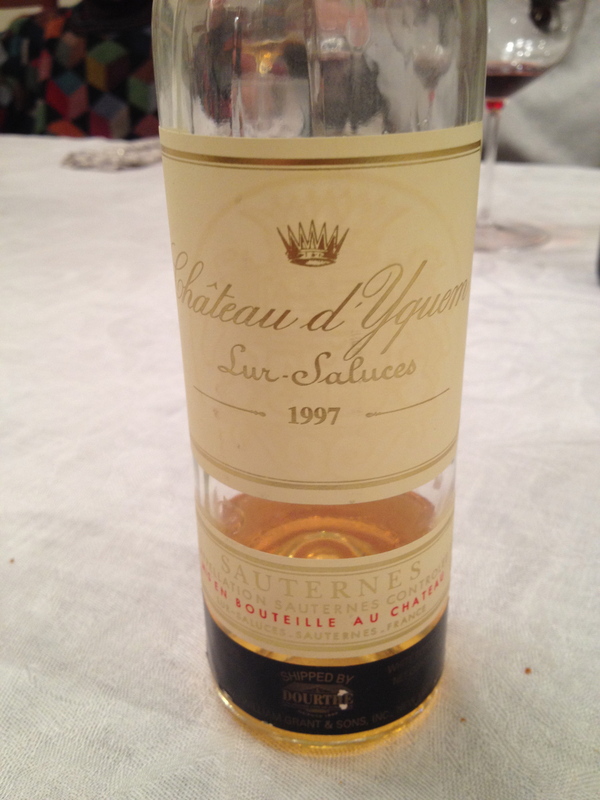 Chateau d’ Yquem 1997 (half bottle). Made from 80% Semillion and 20% Sauvignon Blanc. Harvesting is by hand and the grapes are picked one at a time over a period of time. There is a gently pressing of the grapes and the wine is aged in oak barrels. 1997 is considered a great vintage. There was no Yquem produced in 2012. This is a complex and balanced wine with hints of dried apricot and a touch of tropical fruit. It was wonderful. Jason: Medium golden color. The nose is white flowers, apricots, almonds and marzipan. On the palate this is balanced, deep and nuanced. It was served with a peach and almond tart made by Deborah, Steven’s mother.